No anti-spam software will catch 100% of unwanted email. Some legittimate email may be caught by the SPAM filters (false positives) if the remote sender has a poorly configured email server. Each inbound email is scanned against a series of tests. If an email fails a specific test, a line will be added to the email header. 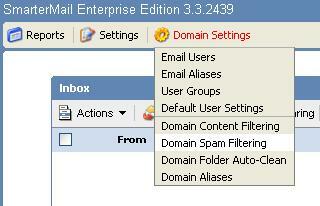 All customers can assign an action for emails that contain specific headers that were added by the anti-spam software. Customers can assign the actions on the mail server on either a domain level (filtering will affect all emails in the domain) or at a user level. 1) Log on to Webmail as the mail server administrator, from the drop down menu DOMAIN SETTINGS on the top of the screen select the option DOMAIN SPAM FILTERING. 2) Select Override spam settings for this domain then click on the Actions-tab above. - No action: the mails will go to the inbox. - Delete message: the mails will be deleted. 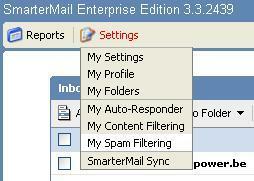 - Move to Junk E-Mail folder: the mails will be moved to the junk folder. - Add text to subject line: (DEFAULT) the mails will go to the inbox. Custom text will be added before the subject of the mail. 4) Click on SAVE (above-right). 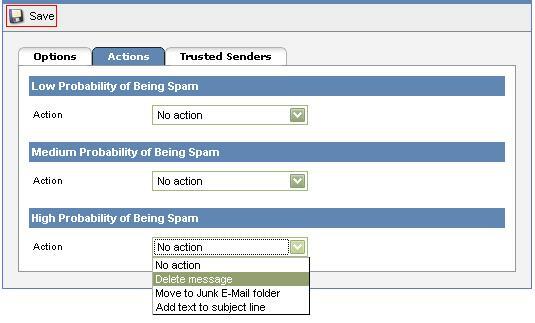 1) Log on to Webmail as the mail server administrator, from the drop down menu SETTINGS on the top of the screen select the option MY SPAM FILTERING. 2) Select Override spam settings for this account then click on the Actions-tab above. "I am extremely satisfied about your service Quick and good answers to all of my questions. Thanks to you, I have been selling more hats online to both men and women. Especially hats for weddings!"